The Hamax Outback child carrier with jogging kit is a cool bike trailer that can be used for strolling or jogging as well as being pulled behind a bike. With the optional accessories, this carrier is a versatile adventure wagon that will keep you outside no matter what the terrain or weather. The Outback is a high-quality product that seats two and has a budget-friendly price considering the materials, features, and design. We really like the Hamax and while it did nothing to tarnish our love of the Thule Chariot Cross 2, it is less expensive and similar enough that we think you'll love what it has to offer for the price. If you don't want to use it as a sled (an option possible with the Thule but not the Hamax) and you don't mind the heavier weight, we think the Hamax is a good budget-friendly solution for parents considering the Thule Chariot Cross 2, but without the budget to buy it. Hamax AS, of Norway, began in 1958 and has become a pioneer in products and gear that promote leisure activities for families with children. They offer equipment like a child bike seat, bicycle trailer, and toboggan with a focus on the safe transportation of children biking or on snow. All of their products are thoroughly tested to ensure that safety and functionality are maintained at all times. Hamax is a part of the HTS Group, which also owns BeSafe, Voksi, Etto, Swisseye, and Packline. The following chart shows the overall score of the Hamax Outback (in blue) compared to the other jogging products we tested in this review. The sections below provide details on the Hamax's performance during testing compared to the other joggers. Individual metric performance determined overall scores with an emphasis on run-ability and ease of use, two metrics we feel are fundamental to overall happiness with the gear of this type. The jogging kit for the Hamax has a fixed front wheel that attaches quickly and is easy to put on and take off for transport. The Hamax earned a 7 of 10 for run-ability using the jogger kit attached (never jog with the strolling wheel). Seven is the second highest score in this metric and the same as the similar but more expensive Thule Chariot Cross 2. The Hamax has a fixed front wheel without adjustable tracking, though our product ran straight and true with no issues staying on course or veering off track. This stroller has an adjustable handlebar covered in dense foam, though it can still feel short for taller users. The Outback has an impressive suspension system that benefits both the passenger and the pusher reducing fatigue while running. Despite being heavier than much of the competition, the Hamax still offers limited rolling resistance and is easy to push and keep at speed. Tipping to turn is also not a problem even with a larger passenger and testers remarked it was easier than they thought it would be. While the Outback may be more difficult to use, the savings over similar bike trailer may make it easy to forget. The Hamax earned a 6 of 10 for ease of use. The Outback is more challenging to use than the Thule Chariot Cross 2, but for some parents, the price savings might be worth the additional effort. The Hamax has more than five steps in the folding process that includes twisting the fold lock, pressing the dual-sided release buttons and pulling up on the side loops while pushing down and folding the stroller into a flatter more compact shape. It isn't difficult, but it requires two hands and takes longer than most with a little more strength. The Hamax has a deacceleration handbrake (above left) that works well, but ours kept slipping around on the handlebar no matter how much we tightened it. A pedal found in the rear of the stroller operates the brake (above right). The pedal is easy to set and release, and it is sandal foot friendly. The Hamax has rear storage in a zippered compartment on the back of the carrier. The bin is really large with lots of room, though it isn't easy to get to and there are no pockets for organization, everything you have will have a place even if it won't be in a specific location as it floats around. The passenger also has mesh side pockets for storing snacks and toys. The pockets are in an accessible position, so buckled children can still reach them. The Hamax sunshade is similar to the Thule Chariot Cross2 with a full cover and large peek-a-boo window (above left) right over the passengers. The entire pod can be enclosed in vinyl (above right) to block out the elements completely, or the mesh cover can be lowered alone for additional airflow. The Hamax also has ventilation mesh behind the seats and mesh panels in the trunk. The Hamax has a 5-point harness in each seat and it is easy to adjust and use. The Outback seats have 5-point harnesses that are easy to use. The buckles are a nesting buckle similar to the one found on the Thule Chariot Cross 2 with an adjustable crotch strap and shoulder straps that have infinite adjustment positions. With room for two, the Hamax has seatbacks that slightly recline for napping. The Hamax seats sit down inside the carrier and have padded seatbacks and bottoms. There is no leg rest, and little one's legs stretch out in front of them. There isn't much leg room and the seat back slopes at an angle, but it doesn't recline. Little ones could nap, but not as flat or comfortably as other options. The Outback does not accommodate any brand of infant seats. 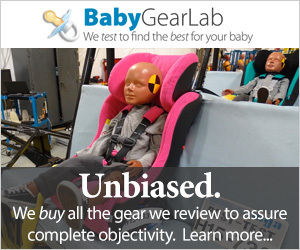 Children must be a minimum of 6 months to use the Hamax according to the manufacturer, but BabyGearLab recommends an age closer to 12-18 months and suggests you discuss this with your child's pediatrician. It took us 14:45 minutes to put the Hamax together; this is the second longest time next to the Thule Chariot Cross 2 which took close to 16 minutes. This jogger requires a screwdriver to assemble and adding the jogging kit adds about 4 minutes to the overall time. The manual is confusing with the written instructions and pictures in different locations, and the assembly instructions are out of order from how you would logically put it together. The wheel guards are difficult to install as you have to screw them on from inside the cabin and the front edge of the seat gets in the way. The Outback must be tipped back for turning when using the jogging kit which makes it a poor choice for crowded or tight spaces. The Hamax earned a 6 of 10 in the maneuverability metric. This level of performance is not as good as the dedicated jogging style strollers (even the fixed wheel options) in part perhaps to its overall larger footprint and weight. The Outback requires tipping to turn, and its large size makes it hard to use in smaller spaces or inside running errands.It is a stable ride and moves over most obstacles smoothly, but it isn't good at making tight turns or moving through busy, crowded sidewalks. It is broader and longer than the Thule Chariot Cross 2 and much easier to use with the swivel strolling wheel attached when you move indoors. The suspension is good, and the seat is well padded for overall passenger comfort. We think the suspension could be a little stiffer, but it isn't bad as is. Even when folded the Hamax is very large and heavy, and while you can remove the wheels it doesn't make it much smaller but it will likely fit in smaller spaces with less hassle. Because it is relatively large and heavy, the Hamax earns a 2 of 10 for weight and folded size. Even when folded the Hamax is still on the large side and removing the wheels doesn't help as much as you hope. The Hamax weighs about 39 lbs making it the heaviest option in the group, even compared to the Thule Chariot Cross 2 which is only around 33 lbs. It is 30,090 cubic inches when folded, which is also the second largest with only the Thule Cross Chariot 2 taking up more space. This product requires additional space to stow it and the ability to lift heavier things to pick it up. The rear wheels can be quickly removed by a press of a button on the hub to make the folded product smaller for transport. The Outback recieved a 9 of 10 for the quality metric with a heavy duty frame and simple design. The Outback is not quite on par with the Thule Chariot Cross 2 but it is close, and if you've never seen the Chariot you won't know the difference. This trailer is a solid unit with no noticeable flaws in workmanship or materials. The materials are heavy-duty canvas, thick vinyl, and rubber flooring that look like they will hold up well. They are not the softest, including the seating area fabric, but they feel durable. This stroller has sturdy plastic joints, ball bearing hubs, rubber tires, and spoke wheels. All the joints and the frame line up well and the fabric covers them tightly without faulty stitching. Baby Insert for Outback — This soft padded insert lets you safely carry baby in your Outback for strolling purposes only. The insert has its own 5-point harness system and reclines little ones at an angle that helps keep airways open. This product is designed for infants and should not for use while jogging or when using the Outback as a bike trailer. Hamax Outback Raincover — This heavy duty rain cover is designed specifically for the Outback and provides additional protection from the elements without blocking the passenger's view of the world going by. The rain cover is easy to put on and take off and stores in the back storage bin. Outback Led light 2 pack — This pack includes a red and a white LED light attachment for the front and back of your Outback to make me more visible in low light conditions. These lights are especially handy when using your child carrier as a bike trailer at night. Hamax makes a single seater of the Outback called the Hamax Outback ONE with Jog Kit. This carrier has the same functionality and features of the Outback, but it is much smaller and only seats one. Should you never plan to have additional children, and your space is at a premium, then the Outback one may be a good option and will save you money.